Altamira Fine Art Jackson is pleased to announce Duke Beardsley as our featured artist and show during the 2017 Jackson Hole Fall Arts Festival. The show opens September 4 and runs through September 23rd. Join us Friday evening, September 8th for the Artist Reception during Palettes and Palates, the popular festival kick off event from 5-8pm. Meet the Artist and enjoy wine and small plates from our neighboring restaurant, "Teton Tiger". Duke Beardsley has a masterly command of drawing technique. 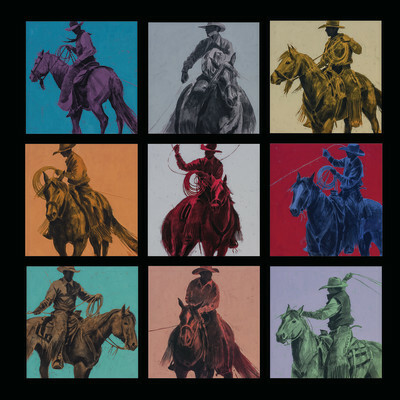 His working cowboy images are rendered in a clever minimalist approach and presented in palettes that lend a Pop art sensibility. His unique art, like his western lifestyle, is a joyful melding of tradition and contemporary styling. His latest show will feature over 15 new paintings, including oil on canvas as well as mixed media on collage. One focal point of the exhibition, "Close Range", features an impressive composition of over two hundred and fifty 3"x 5" masonite tiles mounted to form a peice measuring 81.25 x 48.5 inches. Pre-sales available. Call (307) 739-4700 for availability. Duke Beardsley was born in 1969 in Denver, Colorado. He studied at the Art Center College of Design in Pasadena, California. As a fifth generation Coloradan, Duke Beardsley's western roots run deep and his art reflects those roots. Splitting his time between Denver and his family's cattle ranch in eastern Colorado, he has been drawing and painting images of the American West most of his life. 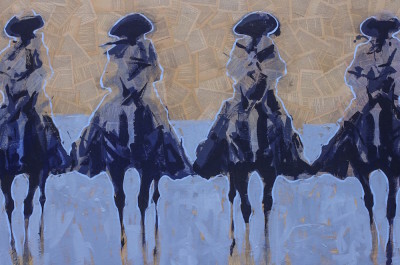 His work blends modern artistic elements with the traditional icons of the West. The result has made him a consistently popular favorite among collectors of contemporary western art. 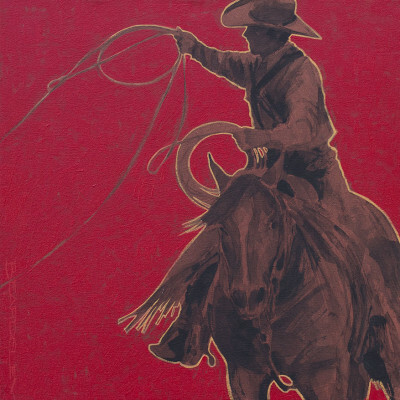 Beardsley won the 2008 Colorado Governor's Award for his piece entitled "Colorado Horsepower." His work can be found in noteworthy collections around the world, including the Forbes Collection, Denver Art Museum, Booth Museum of Western Art, and the State of Colorado. In 2011, he was named Artist of the Year by the Foothills Art Center in Golden, Colorado. His work was commissioned for the 2013 Calgary Stampede poster.